The land is located about 7 miles from frutillar (remarkable for its unique artistic tradition, it is home to one of most reputable open air classical music festivals in the hemisphere). It spans roughly 20 acres of reasonably level land. It also encompasses 1200 feet of beachfront on the lake with direct view to four of the most notorious volcanoes in the region. 1. 50.6 acres of beautiful native woods. 148 acres at the north side of Rupanco lake, quart a mile from shore. Ideal for Eco-resort. The field is suitable for sports such as golf. Lake Rupanco is good for sailing, and one of the cleanest lakes in the world. Fishing: salmon, trout and others. 700 Meters Of Beach. 3000 Meters Of River. 397.2 Hectares. 100 Meters Lake Waterfront. 10.000 M2. Natural Enviroment. My land is beautiful, peaceful and strategically located. Natural environment, but close to everything. 1) It is peaceful and quiet. Completely surrounded by nature. Located approximately at 841 kms from Santiago, near the main city of Valdivia, in the south lake region of Chile, siding Lake RiÃ±ihue, features a beautiful land of 5. 11/2 Storied Spectacular 6 Bedroomed Spanish Style Villa (450m2)nestled on a parcela of 5000m2 of rich landscaped, land, situated in a private complex. Panoramic sea views of Pacific Ocean, in front and a back drop of Mountains. This modern open floor plan house sits on a tranquil 1.25 acres nestled in a majestic valley with the most amazing lake, mountain and volcano views. This home is very close to a number of ski resorts, hot springs, and some of the best fly and lake fishing in the world. In this inviting home, you will find all the amenities you could ever want. The house is located on a beautiful site in fromt of the beach aroun 30 miles from ConcepciÃ³n down town, Chile (south america). the building is inspired by the vernacular architecture of southern Chile With a new contemporary proposal. The design utilizes wood as a principal material. This stilt boat house with a cozy and spacious loft for lodging in the second floor (2110sqft/196 m2) and the chalet (970sqft/90 m2) on a 5.20 acres (2.10hÃ¡)waterfront property is situated in Chiloe archipelago, halfway between Chile's Lake District and the inside passage of northern Patagonia. PROPERTY IN FRONT OF BLUE WHALE FEEDING AREA JUST DISCOVERED! Wenumapu 225-acre real estate is a unique beachfront property surrounded by 200 to 500 years old woods in a small island adjacent to the Great Island of ChiloÃ©. Fairly accessible and situated amid large-scale conservation-oriented projects, it represents also a solid mid-term investment. A little more than 2 ha (5 acres) of land in a semi-urban environment with a great deal of potential. Ideal for building a condo. It is located at roughly 20 min car ride from downtown Valparaiso and ViÃ±a del Mar. Most of the terrain is flat and there access roads in good state even in winter time. For sale, fields of 8 and 12 hectares of land inside of an ecological reserve in southern Chilean Patagonia, X Region, Chile. 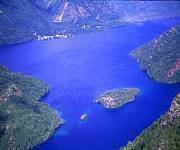 For sale 58 hectares of land inside of an ecological reserve in southern Chile. Suited for real estate and touristic development. 6.000 sq. ft. built, 20.000 sq. ft. land. 3 full bathrooms, guest's bathroom. Central heating. 5 car parking space. Large living room, dinning room sits 12. Wooden floors. Service area, two maids rooms and bathroom. Pantry. Beautiful house with huge boat store room, in 2.0 acres of land amazing mountain, volcano and lake views. The house has a small river and Alpine atmosphere. Developed land has underground utilities. Must-see to believe! All types of outdoor activities await you: water sports, fishing, skiing, white water rafting, hiking/trekking. With more then 100 rooms this centrally located modern hotel facility boasts of a pool, gym, sauna bar and a prestigious restaurant. The salons can handle in excess of 100 people. Fly fishing lodge, 3 totally equipped cabins, 3 km from lake and 5 km from river, hubicado in on the banks of the Lago Verde and Rio Figueroa, surrounded with native forests. Spectacular mountain and river views. Ideal location for family holiday house, restaurant, spa or yoga center. 200 000 square meter lot. Currently with 1000 Californian Walnut trees, which produce between 30-50 tons of Walnuts. One of few lots which has not been developed in the midst of residential Pirque. Great opportunity for contractor/builder to subdivide the land in 40 lots for residential use. Currently no infrastructure on land. I have a 27.68 acres land in an industrial area in Santiago Chile. It is over the principal highway that goes inside Santiago from the north of Chile. It is outside the ring of Santiago, this means that you can use the land for any industrial, residential use. This area can be used in any industrial business, it is in a very real good price.